Hello everyone! I apologize for not posting as often as usual in the past week. I have been doing some traveling and enjoying time with family during the holiday season. I just wanted to let you know what to expect in the coming weeks. 2. Filson 257 an Alternate Use? We all know that the Filson 257 is a great briefcase option for students or for those days when the 256 Original Briefcase just doesn’t cut it. But I have been using it in a different way and I think you may be surprised how versatile this bag truly is. 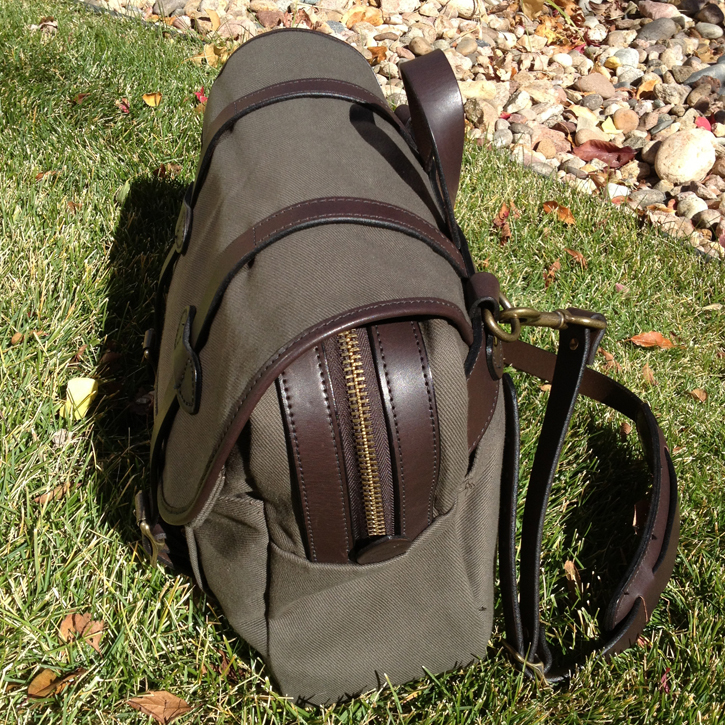 I will also be posting a First Look mini-review for the Filson Small Duffle Bag 220. This bag seems like it would make the perfect weekender. Find out what I think after putting it through its paces and find out which models may be better for your particular needs. So that is where we are headed by the end of the year. I will also continue posting more iconic Filson images and offering my advice. Which reminds me, answering your questions (and responding to comments) is one of my favorite parts of FilsonFan, so please keep them coming. I wish you all a wonderful holiday season and a happy, healthy new year! Today’s iconic Filson image comes from Midwestyle. The guys over there have posted a fantastic review of the 260 Tote Bag ($110) that I want to share with my readers. My wife owns this bag in classic Tan and uses it every single day. From hauling yoga gear, to transporting binders and documents to court, this bag can literally do it all. In addition, at only $110, it is one of the most affordable Filson pieces, so it is a great way to introduce newcomers to the brand. 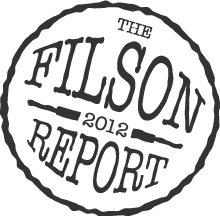 Today, I will be reviewing the Filson 240 Small Carry-On. This bag is very similar (in both design and function) to the Filson 232 Medium Field Bag, so I will be highlighting the differences between the two in order to help you decide which is the best choice. Layout: (1) main compartment, including storm flap with double leather buckle closure; (2) front bellows pockets with snap closures; (1) back exterior pocket and (1) small carrying handle. The Filson 240 is a basic messenger-style bag that can be worn over the shoulder or carried cross-body. It features a spacious, main zippered compartment with no built-in organization. It also has two expandable “billows” pockets on the front of the bag (under the storm flap) that snap closed. The leather trim on edge of the storm flap is one of my favorite design elements and it gives the bag a classic, timeless appearance. It is secured with two leather straps and two brass buckles. Another nice detail is the embossed Filson logo on the ends of the leather straps, which adds a feel of quality to the overall design. The Filson 240 is certainly a versatile bag, but it does have some potential drawbacks that would cause me to consider a couple other Filson models before purchasing this one. I really like the overall look of the Filson 240 and the zipper/flap/buckle combination provides excellent security for its contents, especially in crowded environments. However, it also makes the bag very cumbersome if you need to frequently access your stuff. The three primary storage compartments each require the user to open two different fasteners to access them (Buckle/Snap or Buckle/Zipper). On most messenger bags, the attachment points for the shoulder strap are located on the side of the bag, towards the top. On the Filson 240, the attachment points are located on the back of the bag approximately a quarter of the way down from the top. Why does this matter? This design causes the bag to lean away from you when it is slung over the shoulder. When I carried the bag, I found that I was always fighting to pull it toward me in order to make it more comfortable. The attachment points also create an awkward carry-angle when using the small leather handle. This bag is most comfortable when it is carried cross-body. The small pocket located on the back of the 240 is much shorter than the exterior pockets found on other Filson bags. This is a function of the low attachment points for the shoulder strap. I did not feel comfortable with my iPad in the back pocket because it never quite felt secure. This pocket was not very useful due to its size and placement. I was left with a lukewarm feeling about the Filson 240 after my real-world testing, but there is a silver lining. 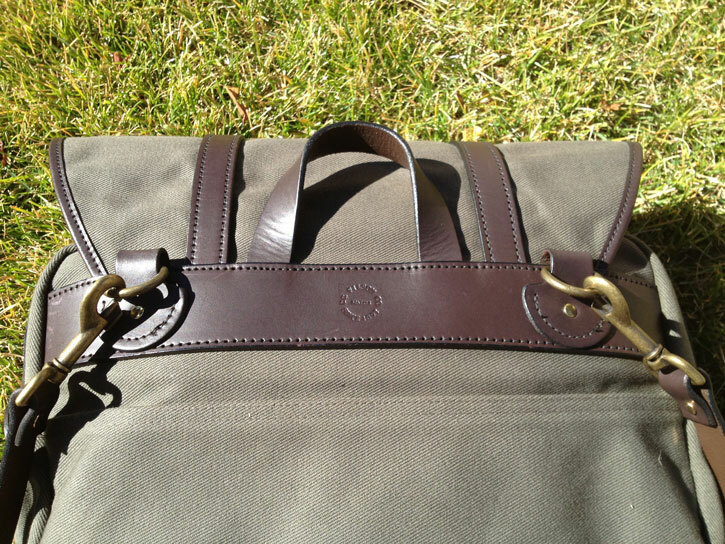 If you really like the classic style of the Filson 240, there is a much better option…the Filson 232 Medium Field Bag. The overall style of the Field Bag is nearly identical to the Small Carry-On, featuring the large storm flap, leather trim and the front bellows pockets. 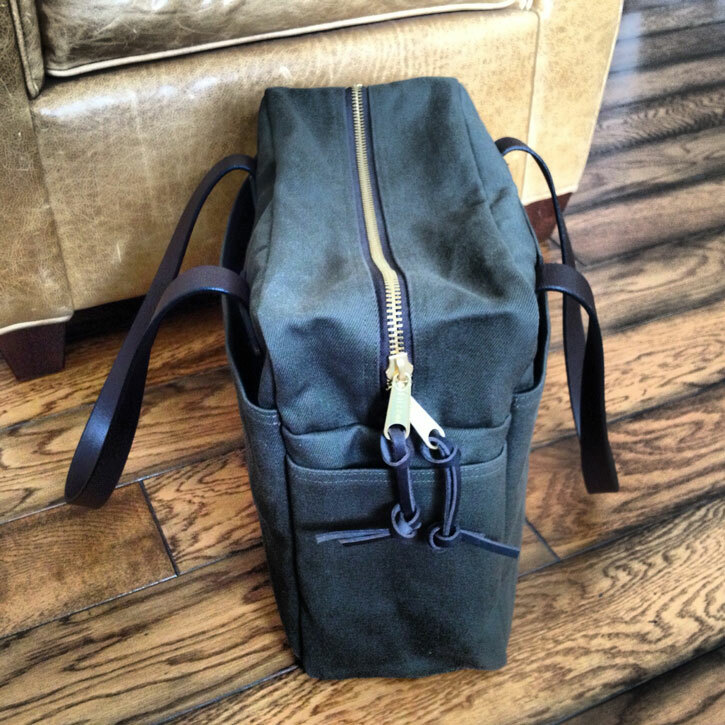 However, the Filson 232 eliminates the zipper over the main compartment. By using only the buckles, the 232 is much easier to access and by removing the zipper, Filson was able to add two functional end-pockets and a double-bottom to create a much more functional and durable bag. As an added bonus, the 232 retails for only $225, which will save you nearly $40 off the MSRP of the 240. In the Field: if you are working in the field and are looking for an open-concept bag to carry small equipment, notebooks and gear, then the Filson 232 Field Bag would be a fantastic choice (and would work much better than the 240). For Travel (as a Carry-On): for short trips, when being used as a carry-on, I find the Filson 261 Zippered Tote, which features more interior volume, a double bottom and four functional exterior pockets, to be a much better choice than the 240. For a Student or Office Worker: as a day bag for a student or city dweller to carry books, a laptop, lunch and perhaps a small jacket, the Filson 257 Briefcase Computer Bag is a much better choice than the 240. In conclusion, the Filson 240 Carry-On is a handsome, well-made bag, but it is a bag that is functionally stuck in the middle between a multitude of other choices that are all better suited to task. Last weekend, I picked up a new Filson Zipper Tote (261) and I wanted to share my first impressions of this extremely versatile daily-use bag. Layout: (1) main compartment; (2) full-length exterior pockets; (2) exterior end-pockets (utility pockets) and a double bottom. 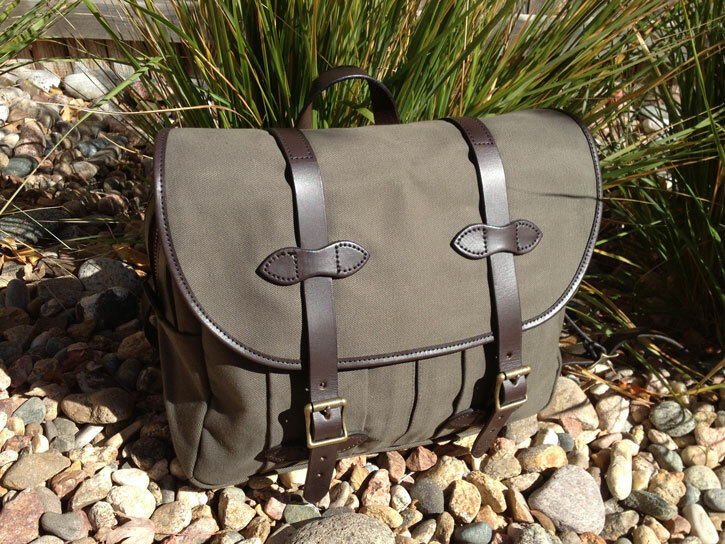 At first glance, this is one of the simplest bags that Filson makes, but it is also one of the most versatile. It is basically one large, zippered compartment with two long strap handles that allow the bag to be hand-carried or easily slipped over the shoulder. The bottom of the bag (and the sides) are all double-walled, which gives this bag a very rugged feel and provides structural rigidity. The Filson 261 does not taper at the bottom like many other tote bags, which gives it a more masculine look and maximizes its carrying capacity. The utility pockets on the ends of the bag are large enough to hold 1 Liter water bottles and the full-length side pockets are perfect for an iPad, a newspaper or some reading material. I was pleasantly surprised how much this tote bag holds. The 261 would make a perfect gym bag (or daily use bag) and would also make a great travel companion for a 2-3 day weekend getaway (using packing cubes). I will post my follow up impressions in a month or so, but I can already tell that this bag will become a personal favorite. 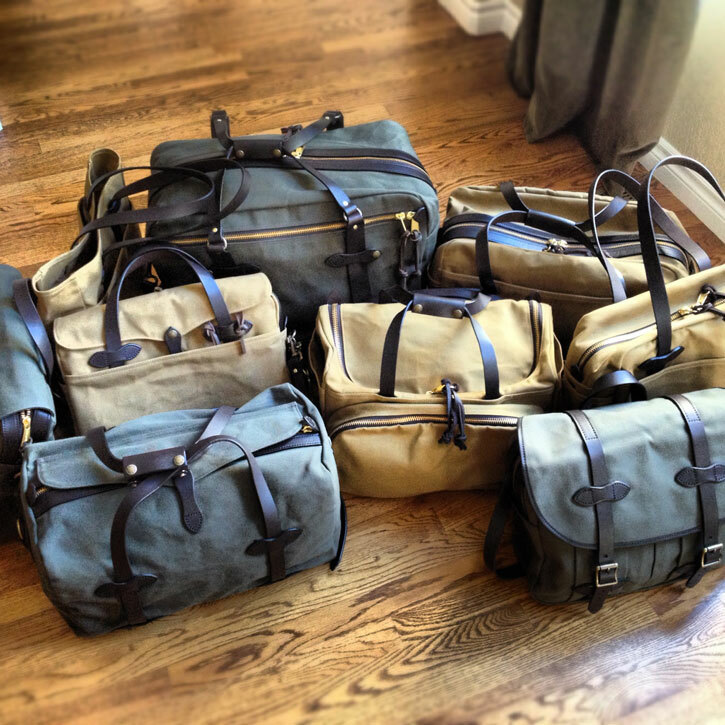 Which Filson Color is Best? You have decided which Filson bag best meets your needs, but there is one final decision to be made. What color should you choose? Classic Tan or Otter Green? Everyone is drawn to certain colors for a variety of different reasons, but there are some fundamental differences between the two that may make your decision a little easier. Most Filson bags are made from 22 oz weather-treated cotton twill trimmed in dark brown bridle leather. 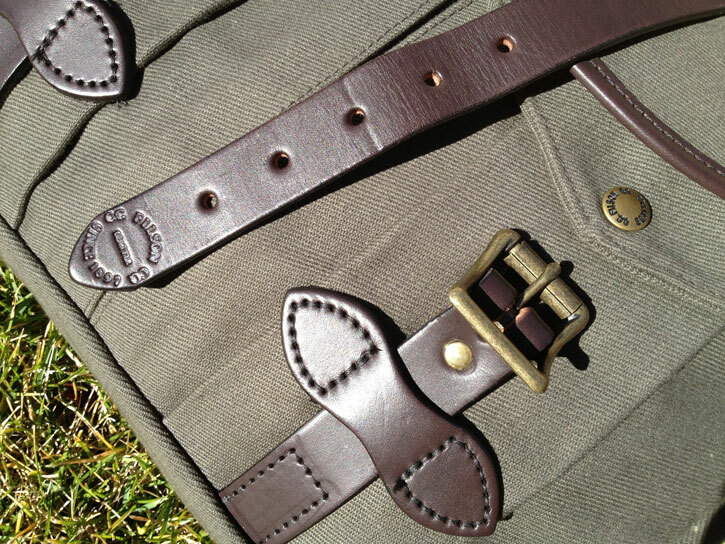 It is this contrast that is the hallmark of the Filson brand. In addition to the leather trim, the bright gold zippers also create sharp visual contrast in the design. The bridle leather shows the most contrast against the classic Tan canvas. However, the exposed zippers tend to really pop next to the Otter Green. Because of the varying ratio of zippers and leather trim on each individual design, some styles tend to look better in Tan and others tend to look better in Otter Green. I recommend comparing the colors in person before you make your final decision. Choosing a Filson color really boils down to your preference for patina. Tan canvas will darken and pick up dirt, light stains, etc. They look fantastic, but tend to have a mottled appearance and show the most character over time. In addition, the classic Tan is more casual in its appearance and tends to make a bolder statement. The Otter Green canvas tends to hide dirt/stains better than the Tan and has a tendency to fade or lighten over time. If your preference is for a worn-in look with a ton of patina, then classic Tan is your best choice. If you want your bags to look new a little longer or you will be subjecting them to harsh travel conditions, then perhaps you would prefer the Otter Green. According to my local Filson Flagship dealer, the classic Tan outsells the Otter Green by a ratio of 2 to 1. It is the color that is most quickly identified with the Filson brand and it is a color that most styles look great in. If you simply cannot make a decision, I would recommend defaulting to classic Tan. The Otter Green is a beautiful, dark color that will fade with heavy use. It is the rarer of the two colors, so it tends to be a little more unique than the tan. It offers a more subtle contrast with the bridle leather trim and is very resistant to stains. Therefore, it makes a great choice for larger travel pieces and tends to fit more conservative office environments a bit better. want a more conservative looking bag for certain office environments. In addition to Tan and Otter Green, many Filson bags are now offered in dark Brown. I have chosen not to include Brown in this discussion because 1) I do not own any Brown Filson bags and I like to speak from personal experience, and 2) I do not find the color to be as visually appealing. Part of what makes Filson bags look so great (to me) is the contrast between the leather and the canvas. When you take away the contrast, I think you take away a little too much of the classic Filson design aesthetic.